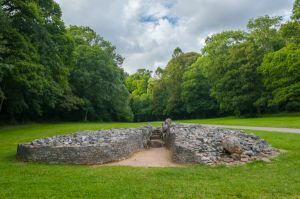 A Neolithic long cairn of the type known as Cotswold-Severn, Parc le Breos takes its name from the huge medieval deer park in which it stands. The tomb is wedge-shaped, aligned on a north-south axis. It is 22 metres long and measures 13 metres wide at the forecourt end, tapering to 6 metres wide at the northern tip. The exposed burial chamber is accessed through a bell-shaped forecourt that leads to a short gallery and then to two pairs of transept chambers. These are small, only about 1.6 metres long and 1 metre wide. The burial chamber is built of upright limestone stones infilled with irregular dry walling. Parc le Breos was in use for anywhere from 300 to 800 years, with the first burials taking place around 3800 BCE. The bones of at least 40 people were found inside the tomb. As is common with this type of communal burial site, the bodies were exposed to animals, birds, and the elements for a time until only the bones were left, and these were disposed inside the chambers in no particular order. One collection of bones in the passage appears to have been deposited without this initial exposure, as an entire corpse. Aside from the human remains, quite a lot of animal bones were found, including bones of cats, dogs, pig, sheep, red deer, and cattle. One of the deer bones dates to 800-200 BCE, so it was deposited long after the tomb was used for human burials. Several human bones are vastly earlier, as old as 11,000 BCE. These may have come from Cat Hole Cave nearby, perhaps as part of some kind of ritual observance. The burial chamber is located 1 mile up a paved forestry road off the A4118, beside the Gower Heritage Centre at Parkmill. There is a small parking area as you reach a camping/pony trekking area, and you can see the burial chamber through a fence on your right. Just go through a gate and walk 100 yards up the paved drive and the chamber is on your left in plain view. There is a [very small] information panel, which honestly could be a lot more informative. You can walk inside the burial mound, right up the central passage and see how the side chambers are constructed. It is interesting that the original cairn would have been quite a bit longer than what we see today; it looks plenty long enough already! It's a fascinating location to find a burial cairn, in a low-lying wooded area, rather than on the slope of a hill where most similar mounds are built. I quite enjoyed visiting Parc-le-Breos, though to be honest, it doesn't take very long at all to explore the site. Across the drive, you can easily see the entrance to Cat Hole Cave. Pennard Castle is just over a mile away. Location: In Parc le Breos Woods, off the A4118 at Parkmill, by the Gower Heritage Centre.